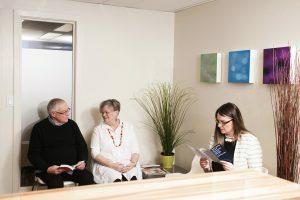 We provide connections with resources for our hearing loss patients and their families. These include community agencies and programs that can assist them with their hearing loss as well as other health or aging-related needs. There are many community programs available that can help people with hearing loss enjoy all the things that they enjoy doing in their lives just as people with normal hearing do. We have excellent contacts with outreach workers and social workers, CARYA services for seniors, Canadian Hard of Hearing Association Calgary, Alberta Health Services, The Kerby Centre, Calgary Seniors Resource Society, Silvera for Seniors, CareWest, Meals on Wheels, Mount Royal University, University of Calgary, Deaf and Hear Alberta, Primary Care Networks, The Alzheimer’s society, and other community agencies throughout the city. Dr. Scarff is a well-respected lecturer at these agencies. Please let us know if you have an agency that you want to share with us or if you would like us to connect with them to provide them with educational information about hearing loss.